First we have, Can't Catch Me! ; this jumper's star is a smiley gingerbread man. This jumper was inspired by a cuddly ginerbread man towelling bath toy I bought for my son a few years ago, which was a surprise hit. 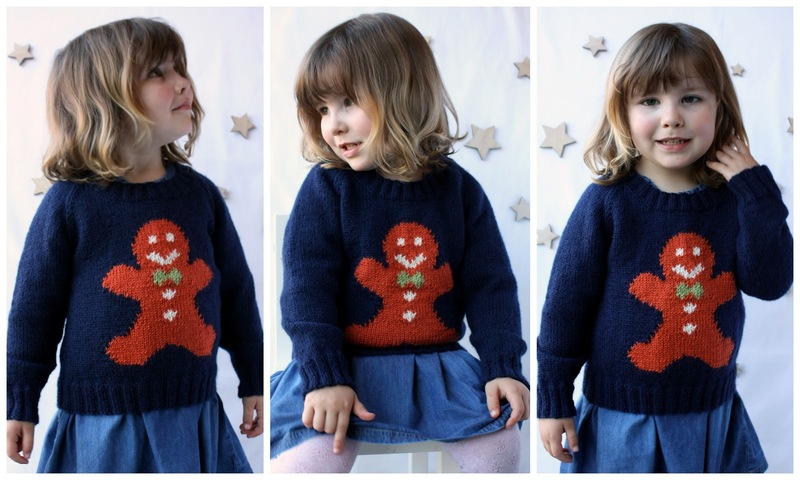 My son loved the cuddly gingerbread man and took him to bed with him every night, so it seemed appropriate that I should design and knit a gingerbread man jumper. I named the pattern Can't Catch Me! after the children's fairy tale The Gingerbread Man. The jumper is knitted in DK weight yarn, making it perfect as a layering piece over the festive season. The sample is knitted in Stylecraft Life DK** (75% premium acrylic, 25% wool, 298 m [325 yds] per 100 g ball) in Navy (2313, MC), Copper (2312, CC1), Cream (2305, CC2) and Fern (2311, CC3). Can't Catch Me! is written in six sizes: 2 (4, 6, 8, 10, 12) years, to fit chest sizes 53 cm [20.75 in], 58.5 cm [23 in], 63.5 cm [25 in], 67 cm [26.5 in], 71 cm [28 in], 76 cm [30 in] with 5 cm [2 in] positive ease. The sample shown is knitted in size 4 years. Second up is Waddle, an aran weight jumper knitted featuring a cute and cuddly penguin. 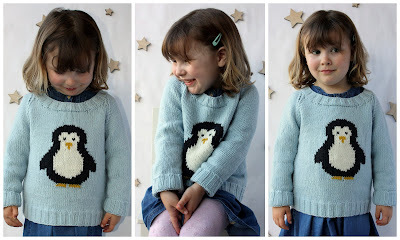 This jumper was designed for my daughter, who loves to have things knitted for her. Penguins are one of my favourite Christmas motifs, so it seemed obvious to include one on a jumper. The jumper is knitted in aran weight yarn, and has a casual fit with 7.5 cm [3 in] positive ease, making it perfect as a cosy extra layer over the festive season. The sample is made from MillaMia Naturally Soft Aran** (100% merino wool, 80 m [87 yds] per 50 g ball) in Sky Blue (226, MC, blue version), Ochre (240, CC1), Slate (200, CC2) and Ivory (221, CC3). Waddle is written for the same six sizes as Can't Catch Me!, but has a more relaxed fit, with 7.5 cm [3 in] positive ease. Both jumpers are knitted in pieces from the bottom up, and the neckline is knitted on in the round after seaming the shoulders of the jumper. The motifs are added using the intarsia technique; the pattern for the intarsia section is provided both as a chart and as written instructions. As a special introductory offer, you can purchase either of these patterns from my Ravelry store with a 15% discount by using the code FESTIVE. This code is valid until 11.59pm BST, Sunday 15th October 2017. Both of these jumpers can be knitted as part of the Vikki Bird Designs' Christmas KAL, which I am hosting in my Ravelry group. If these aren't your cup of tea, why not check out my other festive designs. *These patterns were originally featured in Knit Now magazine. The self-published versions have a wider size range and some shaping details have been altered. You have a very cute model there!